I remember going to my grandma’s house for Sunday dinners when I was a kid. She always served chicken, usually roasted in the oven. We loved going for those dinners; the food was always excellent and it was always fun to see my grandma. My grandma passed away many years ago, so these are cherished memories. As an adult I still like eating Chicken on Sundays, maybe because it brings back those memories of my childhood. I am sure that some of you out there grew up eating chicken on Sundays too. So I am always on the look out for new chicken dishes. I always like the easy ones and the one that I am sharing today can’t get much easier or tastier. 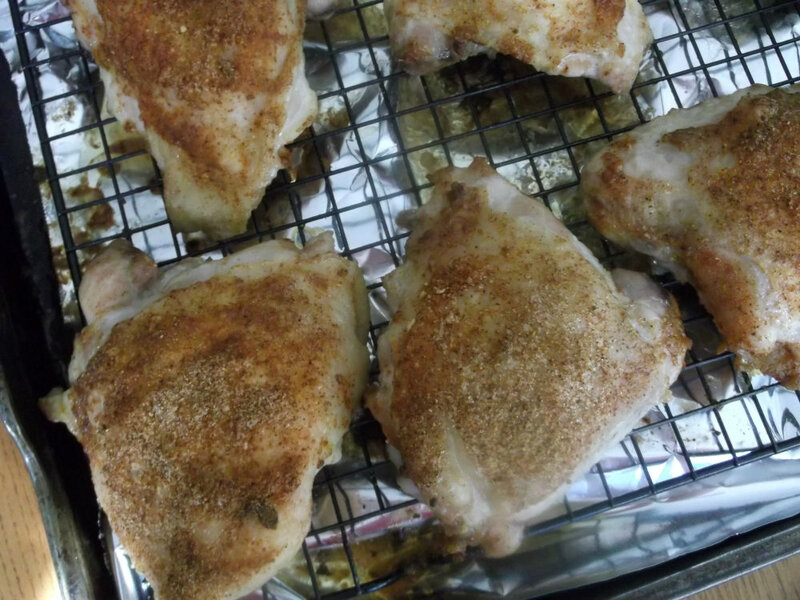 If you don’t like the seasonings that are used for the chicken you can always change them, I think the method of baking the chicken is the high point of the recipe. 2. Line a jelly roll pan with aluminum foil and place a cooling rack on the foil. 3. Dry chicken with paper towel. 4. Combine the seasonings on a plate. 6. Place the chicken on the cooling rack and place in the oven. 7. Place the chicken into the preheated oven. Bake at 450 degrees for 5 minutes. After the 5 minutes turn the oven down to 350 degrees F and continue to bake for about 35 to 40 minutes until the juices run clear. Baking it a high temperature when placed in the oven crisps up the skin and keeps the juice in. This chicken is very moist and tender. 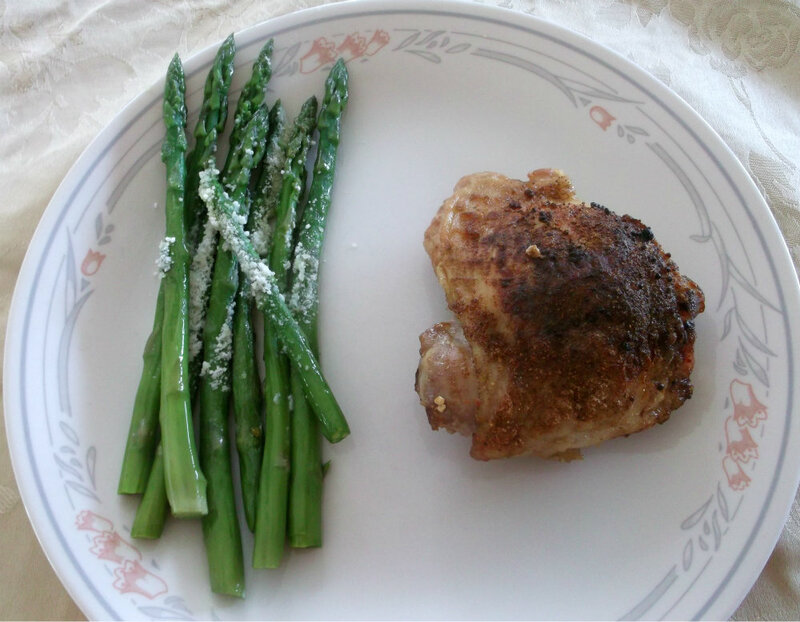 I love chicken thighs… this recipe looks delicious. One can never have too many chicken recipes! 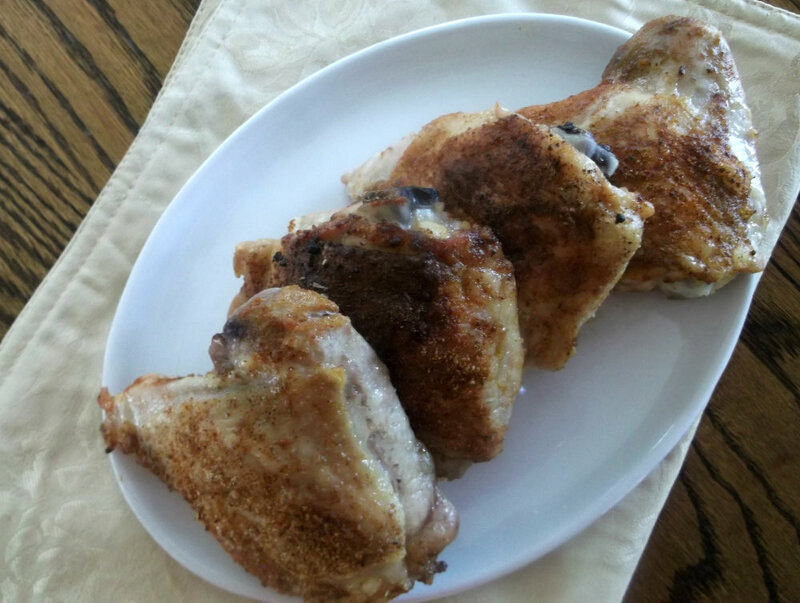 The thighs have so much flavor, too – a great cut. Great recipe – thanks. I like the seasoning 🙂 your chicken looks great. My mother used to make chicken quite often when I was a child as well.